I’m sad that I missed out on this wonderful film for so many years, but I’m happy that I can share it with you and hopefully prevent any more lost time without it. Three things make this film a delight to watch: the sense of danger, the celebration of creativity, and the old-fashioned virtues. Journey with me into uncharted territory as we explore these things that make Swiss Family Robinson such a pleasant surprise. Swiss Family Robinson tells the story of a father and mother and their three sons who must work together to survive after they get stranded on an uncharted tropical island. Right from the get-go, this movie isn’t afraid to put animals in harm’s way. There are a whole bunch of farm animals that are stuck in the belly of a crippled sea vessel. They don’t look too pleased about being up to their ankles in water, but they’re about to receive a real shock when we see how the Robinson family plans to get them ashore. They attach barrels to them and let the animals float in the water. We see more than a dozen animals up to their necks in water, struggling not to drown as they make their way to the island. It’s a harrowing trip, especially when sharks show up and try to eat them. Oh, did I mention this movie has predators? Because it does. A lot of them. So many times when you think that everything is just fine or that things couldn’t get more suspenseful, the movie finds a way to take things up a notch. 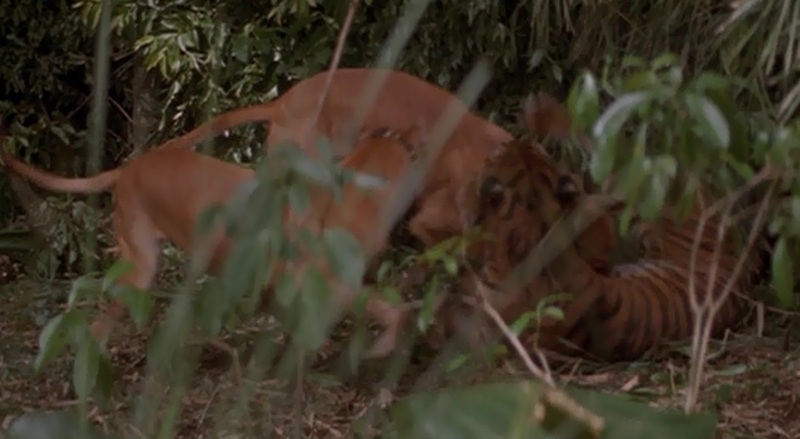 A tiger starts hunting the youngest boy, Francis, but just as it’s about to pounce on the boy, his two dogs jump on it and start fighting with it! These aren’t CGI dogs or tigers; these are real animals clawing at each other! It is so visceral and awesome. And that’s just the tip of the iceberg. We later see Francis’s older brothers, Fritz and Ernst, being assaulted in the water by a giant snake. And the snake doesn’t look like it’s made of rubber; it looks like it’s big and strong enough to strangle them both! Then a zebra gets attacked by hyenas and vultures, and the two older boys have to rescue it. And then all of the boys race atop the zebra, as well as an ostrich and an elephant. There’s no CGI trickery or any other attempts to fake it. These all appear to be real animals putting themselves and the actors in serious peril. And all of it adds to the experience of the film. I felt immersed in the world it was building and invested in the plight of the characters. This movie is a boy’s paradise. There’s nothing to do but be creative, tame nature, and have fun. Fritz is the strongest son, Ernst has the most technical know-how, and Francis loves capturing wild animals and attempting to domesticate them. They, along with their wise father, have a field day when it comes to building a house for themselves and their delicate mother. Do you remember a movie called Top Secret! It’s by the same guys that made Airplane! and The Naked Gun. In Top Secret! they briefly parody The Blue Lagoon, showing a couple of teenagers building a suburban house, complete with automatic garage door and a garage full of bikes and sundry knickknacks. 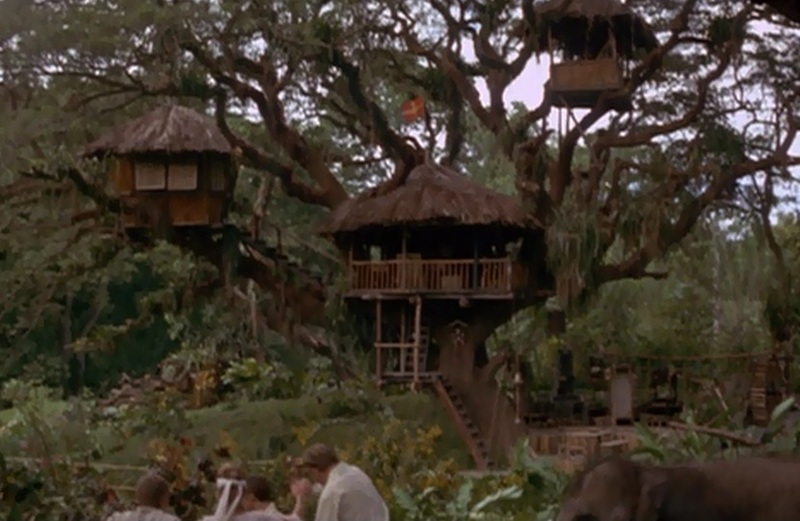 But in Swiss Family Robinson, they actually make a house that puts that joke house to shame. They have running water, expertly crafted staircases, a sunroof, a working organ, and so much more. And it’s all completely plausible. Ernst is constantly thinking of clever solutions to problems. He notices a turtle swimming swiftly through the water as his family struggles to paddle their way to land, so he lassoes it and lets it pull them instead of doing all the work themselves. Later, he figures out how to harness a baby elephant to lift heavy objects into their giant treehouse. He also comes up with quite a few of the traps they use to keep an attacking horde of pirates at bay. Fritz relies on his brawn more than his brain. He puts many of Ernst’s ideas into practice. He’s also a natural leader, acting as his father’s right-hand man. Once the boys build their home, they suddenly have plenty of time to relax, play around, and explore. Fritz and Ernst beg their parents to let them go out by themselves and explore other parts of their island. Their mother finally relents, and the two leave on what turns out to be a long, perilous excursion. The great thing about this movie is that it trusts its young actors to carry a large middle chunk of the story. It never cuts back to the worried parents waiting for their sons to return until the night that they actually do make it back. Swiss Family Robinson is packed with good old-fashioned virtues. These things must have been second-nature to the author of the novel that the film is based on, as well as the filmmakers at the time, but they come across as a relief to me in this day and age. The boys are allowed to be boys while the girls are allowed to be girls. It’s so great. Plus, the first thing the family does when they land on the island isn’t to set up camp, hunt for food, or take any other practical precaution. 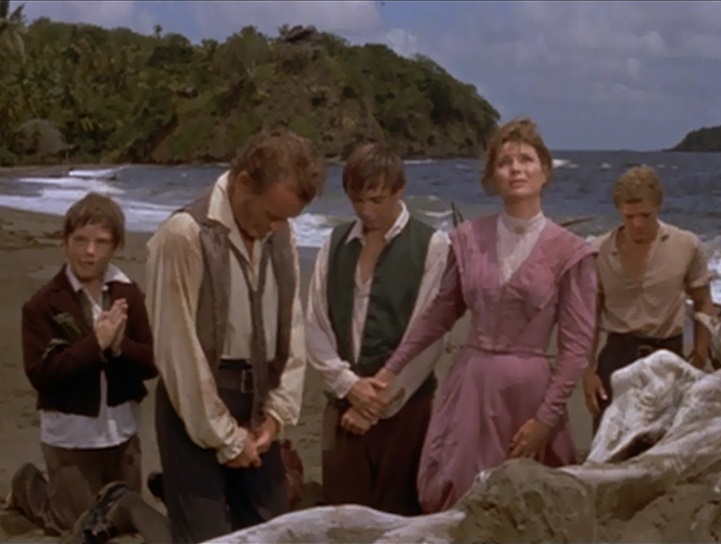 No, the first thing they do when they set foot on the island is to kneel down and pray, thanking God for sparing their lives and asking Him to rescue them. It’s a brief moment, and it isn’t dwelt upon, but it sends a wonderful message about the family’s priorities. They aren’t savages or hell-bent on their survival at any cost. They are only interested in doing what’s right and acting like proper Swiss citizens. Once their immediate needs of food and shelter are taken care of, the mother begins to worry about her family’s future. If they’re stranded on the island for years, her sons will never be able to marry and raise families of their own. So she reluctantly agrees to let Fritz and Ernst explore the island to try to find help or something else to give them hope for the future. During their journey, the two boys rescue someone who claims to be a young boy, so Fritz and Ernst treat this person like he’s one of the guys. They try to joke around with him and treat him as roughly as they do each other. But they soon discover that this “boy” is actually a girl pretending to be a boy so as not to be assaulted by the pirates who had captured her. Once the cat is out of the bag, they start treating her like true gentlemen to a lady. They’re extremely careful and polite in their treatment of her. In fact, they even start competing for her affections. Up to this point, Fritz and Ernst have been inseparable friends, but as soon as Roberta comes into their lives, they pull all sorts of tricks on each other to try to impress her. It’s an interesting (perhaps even unintentional) commentary on the sexes. This film seems to be saying that boys are perfectly happy building civilization by themselves, but as soon as they’re confronted by a limited number of girls, they immediately turn into each other’s worst enemies. But even this turns out to be quite honorable because they’re not just brute savages looking to satiate their lusts. They’re attempting to woo this young woman and win her hand in marriage. And it all ends perfectly, too. She chooses to stay on the island with Fritz while Ernst leaves with a rescue ship to continue his schooling. Most of the family stays on the island and plans to take charge of the future colonization of it by other incoming Europeans. I love Swiss Family Robinson! It’s like no other shipwreck movie I’ve ever seen. I never get frustrated with the characters. They’re all rational and industrious in their own ways. Even when they have conflicts with each other, I always understand their motivations, and I’m not left rooting for one character at another’s expense. It’s worth it just for all the animal fights! Cast away your doubts and you’re shore to love Swiss Family Robinson. This entry was posted in Pleasant Surprises and tagged adventure, animals, boys, comedy, disney, drama, family, films, girls, movie review, movies, movies based on books, relationships. Bookmark the permalink. I loved those old live action Disney movies! Sunday nights were my favourites, when CBC ran “The Wonderful World of Disney” and I’d get to watch all sorts of Disney greats. While CBC does still do The Wonderful World of Disney, they’ve stuck with animated movies lately.